Our company now manufactures the EasyPick™ harvest assistant exclusively. Effective October 2012, we discontinued production of the AccuProbe™ Soil Sampler in order to focus all our efforts on the EasyPick™ line of equipment. Naber's Ag Equipment LLC is also the sales & marketing company for these products, so if you are interested in purchasing one of our machines, or you need more information than what is found on this website, please use the contact information at the bottom of the page. As a small family owned and operated company, we are able to quickly adapt to customers' unique requirements and still maintain the quality of service you deserve. That ability to adapt let's us build or customize equipment for any special situations our customers may have. We are directly involved in production agriculture through our own farming operation and have been involved in an equipment repair and maintenance business since 1974. Both of these activities give us hands on experience with both the usage and the mechanical requirements of machinery used in agriculture and ag related businesses. Our commitment to building quality equipment is founded on two fundamental beliefs: We believe in building products that do the job for which they are designed and do it very well. In addition, we believe equipment should last for many years of service with minimal upkeep. To that end, we use materials and components that have proven themselves to be dependable in agricultural and industrial applications. The end result is a product that is reliable, yet simple, and saves you both work and money. The EasyPick™ Harvest Assistant line of equipment was born out of necessity on our own farm back in 1996, originally for use in removing strawberry blossoms in the year of establishment. In subsequent years, it became necessary to harvest more and more of our strawberry crop with our own staff, instead of relying on the u-pick customer. That, coupled with the ever changing labor pool, forced us to look at ways to make strawberry harvesting easier and thereby more enticing to older, more experienced workers. Hence the birth of the EasyPick™ Harvest Assistant and, since we were so impressed at how valuable the machine was on our farm, we decided to build and market the machine to other strawberry and/or vegetable growers. We presently have machines in 12 states, Canada and Europe. At the request of one of our customers in late 2016, we developed a self-propelled cart for harvesting asparagus. After building the prototype and subsequently the first production model, we were able to put a machine in the field in the spring of 2017. 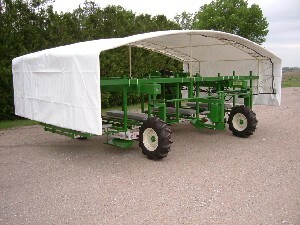 After field testing and a few minor modifications, we are now able to offer the AC148 Asparagus Cart to our customers. You will find more information on the Asparagus Cart page. For more detailed information on any of these products, click on the links above and then, please, give us a call.